Taiwanese idol drama “In Time with You” has been very popular recently, and the drama has also made popular the cute “square head lion” that has personality. Silver jewelery industry has cooperate with the drama producer to launch the merchandise related to the drama, and has created a new topic of discussion again. In fact, the square head lion is originated from original animation work Migsaid (米各說) produced by Gamania Digital Entertainment (遊戲橘子). 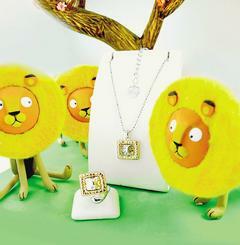 Silver jewelery brand “Story Accessory” integrated resources and launched the exclusively licensed sterling silver necklaces and rings of Lion Square Head. The Lion Square Head focuses on the concept of unique distinction, chooses what is good and holds fast to it, be yourself, and does not follow the crowd. The fine silver necklace which made used of double color electroplating design shows the vivid charm of square head lion, arranging with 16-inch section bead chain, the price is fixed at NT$3180. The fine silver ring has the design that the ring size can be manually adjusted, with the listed price of NT$2980.